Know your flood risk and sign up for a flood warning. 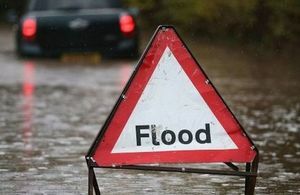 The Environment Agency is urging residents and businesses in Yorkshire to ensure they know their flood risk and sign up to receive flood warnings. It comes as its annual awareness-raising campaign is launched on Tuesday, November 3. Flood management officers are reminding the public of the damage that can be caused by flooding, and advising on what people can do to keep themselves safe and limit the impact of flood waters on their property. The Environment Agency is urging more people to sign up to access flood risk information. In Todmorden and Hebden Bridge in the Calder Valley, more than 80% of residents who are eligible to receive flood warnings from Floodline Warnings Direct have signed up. There are also high sign up rates in Ripon, Catcliffe (near Sheffield) and areas surrounding Wyke Beck in Leeds. But some areas have low sign ups, such as areas of Doncaster and Leeds, and large parts of Hull, which received a new flood warning service at the end of 2014. Flooding can have a devastating effect on people’s lives, with as many as one in six properties at risk of flooding in the UK. So it’s essential that people understand the risks that flooding poses to property and personal safety, and that they find out what they can do to keep themselves warned and informed against any future flood risk. While we work hard together with our partners to reduce the risk of flooding to properties across Yorkshire, there are many useful precautions people can take, including ensuring they know their flood risk and signing up to receive flood warnings. As well as checking flood risk, residents can also find out what action they can take to protect their personal safety and property by visiting the Environment Agency “floods destroy” website. People can follow the campaign on Twitter via #floodaware or via the Environment Agency blog. The campaign will run from 3 until 13 November. Flood schemes have protected an extra 177,000 properties in the last four years. There have been record levels of investment, with £2.3 billion being spent over the next six years to reduce flood risk to 300,000 more properties.